Android users can now gear up and get ready to be chased by giant apes and cling on to ropes across lands , all courtesy of Temple Run 2. 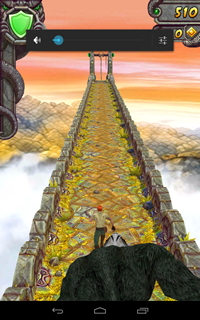 Temple Run happens to be a popular mental physics game produced by Imangi Studios. This fast paced arcade game can be downloaded for free from the Google Play Store for Android Phones and Tablets. This new game throws you in a jungle environment and just like the first one , forces you to make your way via twisted turns. The basic game is free but built-in app purchases enable you to purchase coins via payment through Google Store. We got our hands and minds-on the game and it managed to keep us entertained for long with the better graphics. Happy gaming, we got download links for you’ll below.